With any cosmetic injection there will always be a chance for bruising and swelling. Please allow 5 – 7 days prior to any big event for downtime. Everyone is different and just because you didn’t bruise the last time doesn’t mean you wont this time. Start taking Arnica tablets 5 days prior to injection OR Bromelain 2 weeks prior to injections. After your treatment you can use Tylenol for any discomfort. Avoid taking meds listed above for 2 days. Apply Arnica gel several times/day to reduce swelling. Use cold packs on the injected area as needed for swelling or discomfort. Please avoid applying makeup for at least 24 hours post injection to avoid any bacteria getting into your injection sites. Kybella is the first and only non-surgical treatment approved by the FDA for contouring and improving the appearance and profile of mild to severe fat below the chin and jaw line. This is also known as submental fat or fullness; i.e. a “Double Chin”. Kybella effectively removes excess fat under the chin and neck, leaving a smooth jawline without the necessary recovery time of other treatments like liposuction or neck lift surgery. Kybella is a synthetic formulation of deoxycholic acid which is a naturally occurring molecule in the body that aids in the breakdown and absorption of dietary fat. When injected into targeted fat pockets, Kybella causes the rapid destruction of the fat cells by breaking down their cell membrane. 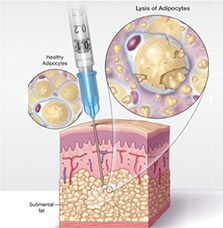 The damaged fat cells are then removed from the area and the body by the body’s natural metabolic process. Kybella only targets fat cells; all other cells and tissue remain unaffected. It is important to note that this process is different from losing weight. When an individual loses weight, the fat cells shrink; leading to a reduction in overall visible volume. However, Kybella permanently destroys the fat cells at the treatment site, thus achieving results that are permanent (unless there is a big change in your lifestyle and dietary habits that cause the remaining fat cells to expand significantly). Are multiple Kybella treatments required? The safety profile of KYBELLA® is well characterized. The most common side effects are swelling, bruising, pain, numbness, redness and areas of hardness around the treatment area. Rare side effects include trouble swallowing and nerve injury to the marginal mandibular nerve that can cause an uneven smile. These side effects usually resolve within one month of the injection and are not permanent. Platelet Rich Plasma for Facial Rejuvenation: PRP is a growth-factor rich golden liquid derived from your own blood. It ramps up stem cell production. Increasing the elastin and collagen syntheses in the areas that are treated. It is a perfect treatment for those who are not ready for Dermal Filler. It can be used to treat under eye areas hollows and dark circles or in conjunction with many resurfacing treatments to help increase the healing process. Platelet Rich Plasma for hair re-growth: This plasma is rich in growth factors that can help stimulate your hair follicles to function the best they can. If you’ve noticed your hair part is getting wider or your hair is just not as thick as it used to be, this is an exciting new therapeutic option for men and women who require stimulation of hair growth. What happens during Platelet Rich Plasma therapy? The blood will then be spun in a centrifuge to separate the platelet plasma from the red blood cells. What is left is a golden liquid that contains growth factdors, this is what is referred to as PRP . A topical local anaesthetic will then be applied to the area that is being treated. The PRP will then be injected into the skin in the desired area using a very fine needle. Injections will be given multiple times in multiple locations in order to give an overall improvement to the area. The whole procedure usually takes about 30 minutes. In general, the procedure of injecting the filler is safe, with very little downtime, and with results that can be seen immediately. Most often the most common side effect is bruising and swelling. However, there is a rare, but extremely significant potential risk, that patient’s need to always be aware of: Vascular Occlusion or Vascular Compromise. A Vascular occlusion can be devastating causing tissue damage (ulceration or loss of skin from disruption of blood flow). Make sure your provider understands the risks and is trained and prepared to deal with any complications that may occur. Please see our blog for more information on this topic. All Peels require one to seven days to heal. Treated skin will initially be red and may scale. With each Chemical Peel clients will often have a post care treatment regiment to follow at home. Makeup can usually be worn the next day. This will vary from client to client. Sunscreen should always be worn at all times especially during the peeling stage. All Peels require one to seven days to heal. Treated skin will initially be red and may scale. Lotion or cream should be applied until the skin heals, followed by daily use of sunscreen. Makeup can usually be worn the next day. This will vary from client to client. In the past most Chemical peels were generally used for light-haired and fair skinned people. In recent years there have been newly formulated peels that are targeted at darker skin types. Darker skin toned clients will require a pre-treatment skincare regimen at least 4-6 weeks prior to prep the skin for best possible results. Have used Retin-A, Renova, prescription skin care products, products that contain ascorbic acid, bleaching or skin-lightening agents or other acid-based products in the last 5-7 days.